How do you build meaningful relationships with your agents? Here’s a tip: don’t bother starting with a coffee meeting! It all starts with creating value for your realtors – mostly through helping them with lead generation and lead conversion. 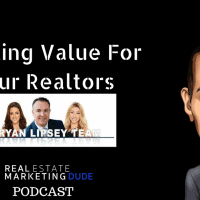 For this episode of The Real Estate Marketing Dude, I’ve invited Ryan Lipsey on to talk about he goes about creating value for his clients. Ryan specializes in business planning and marketing solutions for agents of all levels, and having been in the business since 2001, he knows a ton about what agents want, and that’s leadership. His philosophy is to be as good as his agents at their jobs, constantly learning and being coached, so that when they’re busy doing their business, he’s there to help them with solutions to keep their business going. We both agree that there’s a disconnect between most agents and their brokers, and that’s because most brokers are “checked out”, operating on an outdated business model that’s no longer relevant. Ryan and I explore that idea, and discuss what makes the modern real estate business different from even 10 years ago. Finally, we dive deep into how Ryan uses algorithms to identify potential urgent and distress sellers (all from public records) and then how he uses that information inside his pre-existing spheres of influence to generate strong leads. What constitutes an “urgent” or “distress” seller? How can you identify potential distress sellers in your sphere?